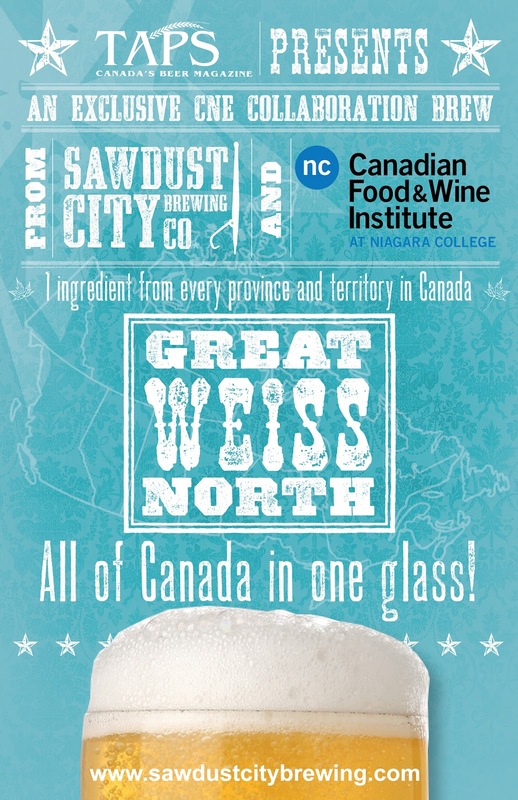 The Sawdust City Brewing Co.: So When is Canada a Melting Pot and Not a Mosaic? So When is Canada a Melting Pot and Not a Mosaic? So here is the poster for the Great Weiss North, our first collaboration with The Niagara College Teaching Brewery. Shannon Seppa, our Design Guru, just finished putting it together. Pretty sharp ,eh? As for the beer itself, both batches are in the fermenter and from last I heard, it's coming along nicely. Gordon Vale, one of the students at the College and one of the brewers on hand to help with the collaboration brew, tried a sample from the fermenter and described it as "a plate of pancakes with syrup on it". You can't get much more Canadian than that, now can you? The beer should be finished primary fermentation by now and has probably been cooled and is aging as we speak. I'm not there to confirm this and I won't be returning to the College until Thursday, I'm just guessing here, but Jon Downing, professor and brewmaster at Niagara said everything was coming along well. If all continues on this path and everything goes according to plan the beer should be ready for release on the first day of the CNE, Friday, August 19th. Remember though, this is a special brew and it will only be available for the duration of the CNE which comes to an end Monday, September 5th. So to answer the question posed in the title, "When is Canada a Melting Pot and Not a Mosaic?" It's when you put all of Canada into one beer! Now we all know that Canada is a mosaic and we celebrate all cultures of the world within our borders. One of the things that makes Canada great is that we allow everyone to bring a little piece of themselves into our little corner of the planet here in the Great White North. But in this case, as our beer ages in the fermenter, we're hoping that all those various ingredients and distinct flavours from across the country come together and create a cohesive flavoured beer, melting into one unique ale that screams Canada with every sip! So stay tuned and be sure to check back again soon as we are sure to have more information on this truly Canadian beer in the coming weeks.